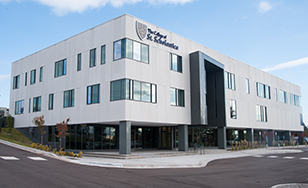 The Health Science Center is located in Duluth's new BlueStone development. The College's new state-of-the-art Health Science Center is earning rave reviews from graduate Physical Therapy and Occupational Therapy students and faculty. The 45,000-square-foot facility at 940 Woodland Ave. in the BlueStone development became home this fall to 68 OT students and 84 PT students. "It feels 21st century," said second-year PT student and design aficionado Blake Longacre, who loves the building's "incredibly striking architecture." Second-year PT student Ellen Gallagher enjoys the building's convenient location and parking, along with its many conference rooms. "We have a ton of group projects," Gallagher said. "It makes it really easy to have our own space instead of trying to talk over each other in one classroom." "It's certainly made a difference in terms of the effectiveness in being able to deliver the materials, both lecture application and in the labs, because we have dedicated space now," said Sandra Marden-Lokken, longtime PT faculty member and former program chair. OT Program Chair Steven Cope said the new space gives faculty greater flexibility, as class and clinic schedules can coexist smoothly. "It's opened up our curriculum. We now have our classrooms available to us all day," Cope said. A highlight of the new building is the maurices Community Clinic, named for its main sponsor. Students gain interdisciplinary real-world experience while serving uninsured and underinsured community members. Marden-Lokken said the clinic creates a realistic space in which students can hone their skills. "Everybody has been totally amazed by the setup and the ability for students to have that real-life experience." Longacre appreciates the "state-of-the-art" space. "The clinic makes the patients feel very much at ease. It's top-of-the line for transitioning students into a professional atmosphere." The new building has freed up space on the main campus for expansion of the College's nursing programs and other academic programs. It will also be home to the College's new Physician Assistant program starting in Fall 2017, pending accreditation. "As faculty in a developing program, it's essential to our success to have the support of experienced educators," said Kim Kruger, chair of the PA program. "The new building design creates a feeling of community and provides opportunities to connect with others in a way we could never do before."